Osteosarcoma is the most common malignant bone tumor. [1, 2] It is an ancient disease that is still incompletely understood. Osteosarcoma is thought to arise from primitive mesenchymal bone-forming cells, and its histologic hallmark is the production of malignant osteoid. Other cell populations may also be present, as these types of cells may also arise from pluripotential mesenchymal cells, but any area of malignant bone in the lesion establishes the diagnosis as osteosarcoma. Osteosarcoma is a deadly form of musculoskeletal cancer that most commonly causes patients to die of pulmonary metastatic disease (see the image below). [3, 4, 5, 6, 7] Most osteosarcomas arise as solitary lesions within the fastest growing areas of the long bones of children. The top three affected areas are the distal femur, the proximal tibia, and the proximal humerus, but virtually any bone can be affected. 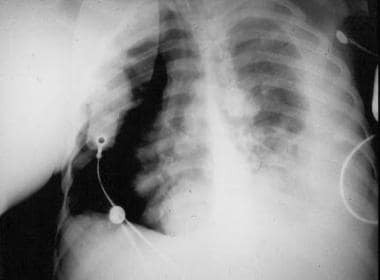 Chest radiograph of patient with osteosarcoma who died from pulmonary metastatic disease. Note the presence of a pneumothorax as well as radiodense (bone-forming) metastatic lesions. Guidelines for the management of osteosarcoma have been published (see Guidelines). A number of variants of osteosarcoma exist, including conventional types (osteoblastic, chondroblastic, and fibroblastic), telangiectatic, multifocal, parosteal, and periosteal. This article only addresses conventional osteosarcoma (often referred to simply as osteosarcoma). Rapid bone growth appears to predispose persons to osteosarcoma, as suggested by the increased incidence during the adolescent growth spurt, the high incidence among large-breed dogs (eg, Great Dane, St Bernard, German shepherd), and osteosarcoma's typical location in the metaphyseal area adjacent to the growth plate (physis) of long bones. Genetic predisposition plays a role. Bone dysplasias, including Paget disease, fibrous dysplasia, enchondromatosis, and hereditary multiple exostoses and retinoblastoma (germline form) are risk factors. The combination of constitutional mutation of the RB gene (germline retinoblastoma) and radiation therapy is linked with a particularly high risk of developing osteosarcoma, Li-Fraumeni syndrome (germline p53 mutation), and Rothmund-Thomson syndrome (autosomal recessive association of congenital bone defects, hair and skin dysplasias, hypogonadism, and cataracts). The only known environmental risk factor is exposure to radiation. Radiation-induced osteosarcoma is a form of secondary osteosarcoma and is not discussed further in this article. Patients with an elevated ALP at diagnosis are more likely to have pulmonary metastases. In patients without metastases, those with an elevated LDH are less likely to do well than are those with a normal LDH. Bu et al conducted a meta-analysis of eight published studies to determine whether p16(INK4a) is a prognostic factor for patients with osteosarcoma. The meta-analysis showed that a high level of expression of p16(INK4a) was significantly associated with favorable overall survival. The investigators concluded that p16(INK4a) is an effective biomarker of survival for patients with osteosarcoma. Ma et al conducted a study to determine the diagnostic and prognostic value of circulating miR-148a in the peripheral blood of patients with osteosarcoma. Expression of miR-148a was significantly associated with tumor size and distant metastasis. High expression of miR-148a was associated with poor overall survival and poor disease-specific survival. The investigators concluded that detection of circulating miR-148a expression in the peripheral blood is useful in identifying patients with osteosarcoma who have a poor prognosis. A study by Zhao et al found that high expression of the oncoprotein transient receptor potential melastatin member 8 (TRPM8) was predictive of a poor prognosis in patients with osteosarcoma, in that it was associated with higher clinical stage and distant metastasis, as well as with shorter overall survival and disease-free survival. TRPM8 may prove to be a useful molecular target for therapy in osteosarcoma patients. Clinical staging as it relates to prognosis is discussed elsewhere (see Staging). In a retrospective study by Kim et al, the records of 331 patients with stage II osteosarcoma who had undergone surgery and chemotherapy were reviewed. The authors found that initial tumor size appears to be associated with histologic response and is an important prognostic factor in osteosarcoma. Other studies have shown that patients in whom a good histopathologic response to neoadjuvant chemotherapy has been achieved (>95% tumor cell kill or necrosis) have a better prognosis than those whose tumors do not respond as favorably. Marulanda GA, Henderson ER, Johnson DA, Letson GD, Cheong D. Orthopedic surgery options for the treatment of primary osteosarcoma. Cancer Control. 2008 Jan. 15(1):13-20. [Medline]. [Full Text]. Vander Griend RA. Osteosarcoma and its variants. Orthop Clin North Am. 1996 Jul. 27(3):575-81. [Medline]. Peltier LF. Tumors of bone and soft tissues. Orthopedics: A History and Iconography. San Francisco: Norman Publishing; 1993. 264-91. Campanacci M. Preface. Bone and Soft Tissue Tumors: Clinical Features, Imaging, Pathology and Treatment. 2nd ed. New York: Springer-Verlag; 1999. Weis LD. Common malignant bone tumors: osteosarcoma. Simon MA, Springfield D, eds. Surgery for Bone and Soft-Tissue Tumors. Philadelphia: Lippincott-Raven; 1998. 265-74. Gorlick R, Janeway K, Marina N. Osteosarcoma. Pizzo PA, Poplack DG, eds. Principles and Practice of Pediatric Oncology. 7th ed. Philadelphia: Wolters Kluwer; 2016. 876-97. Arceci RJ, Weinstein HJ. Neoplasia. MacDonald MG, Seshia MMK, eds. Avery's Neonatology: Pathophysiology and Management of the Newborn. 7th ed. Philadelphia: Wolters Kluwer; 2016. 1048-60. Kim SY, Helman LJ. Strategies to Explore New Approaches in the Investigation and Treatment of Osteosarcoma. Cancer Treat Res. 2010. 152:517-528. [Medline]. Clark JC, Dass CR, Choong PF. A review of clinical and molecular prognostic factors in osteosarcoma. J Cancer Res Clin Oncol. 2008 Mar. 134(3):281-97. [Medline]. Pochanugool L, Subhadharaphandou T, Dhanachai M, et al. Prognostic factors among 130 patients with osteosarcoma. Clin Orthop Relat Res. 1997 Dec. 345:206-14. [Medline]. Tsuchiya H, Tomita K. Prognosis of osteosarcoma treated by limb-salvage surgery: the ten-year intergroup study in Japan. Jpn J Clin Oncol. 1992 Oct. 22(5):347-53. [Medline]. Taylor WF, Ivins JC, Unni KK, et al. Prognostic variables in osteosarcoma: a multi-institutional study. J Natl Cancer Inst. 1989 Jan 4. 81(1):21-30. [Medline]. Hudson M, Jaffe MR, Jaffe N, et al. Pediatric osteosarcoma: therapeutic strategies, results, and prognostic factors derived from a 10-year experience. J Clin Oncol. 1990 Dec. 8(12):1988-97. [Medline]. Meyer WH, Schell MJ, Kumar AP, et al. Thoracotomy for pulmonary metastatic osteosarcoma. An analysis of prognostic indicators of survival. Cancer. 1987 Jan 15. 59(2):374-9. [Medline]. Yang J, Yang D, Cogdell D, Du X, Li H, Pang Y, et al. APEX1 gene amplification and its protein overexpression in osteosarcoma: correlation with recurrence, metastasis, and survival. Technol Cancer Res Treat. 2010 Apr. 9(2):161-9. [Medline]. Kubista B, Klinglmueller F, Bilban M, Pfeiffer M, Lass R, Giurea A, et al. Microarray analysis identifies distinct gene expression profiles associated with histological subtype in human osteosarcoma. Int Orthop. 2011 Mar. 35 (3):401-11. [Medline]. Mirabello L, Troisi RJ, Savage SA. Osteosarcoma incidence and survival rates from 1973 to 2004: data from the Surveillance, Epidemiology, and End Results Program. Cancer. 2009 Apr 1. 115 (7):1531-43. [Medline]. Punzalan M, Hyden G. The role of physical therapy and occupational therapy in the rehabilitation of pediatric and adolescent patients with osteosarcoma. Cancer Treat Res. 2010. 152:367-84. [Medline]. Song WS, Kong CB, Jeon DG, Cho WH, Kim MS, Lee JA, et al. Prognosis of extremity osteosarcoma in patients aged 40-60 years: a cohort/case controlled study at a single institute. Eur J Surg Oncol. 2010 May. 36 (5):483-8. [Medline]. Bu J, Li H, Liu LH, Ouyang YR, Guo HB, Li XY, et al. P16INK4a overexpression and survival in osteosarcoma patients: a meta analysis. Int J Clin Exp Pathol. 2014. 7 (9):6091-6. [Medline]. [Full Text]. Ma W, Zhang X, Chai J, Chen P, Ren P, Gong M. Circulating miR-148a is a significant diagnostic and prognostic biomarker for patients with osteosarcoma. Tumour Biol. 2014 Dec. 35 (12):12467-72. [Medline]. Zhao W, Xu H. High expression of TRPM8 predicts poor prognosis in patients with osteosarcoma. Oncol Lett. 2016 Aug. 12 (2):1373-1379. [Medline]. Kim MS, Lee SY, Cho WH, et al. Initial tumor size predicts histologic response and survival in localized osteosarcoma patients. 1: J Surg Oncol. 2008 Feb 12. 97(5):456-61. [Medline]. Kubo T, Furuta T, Johan MP, Adachi N, Ochi M. Percent slope analysis of dynamic magnetic resonance imaging for assessment of chemotherapy response of osteosarcoma or Ewing sarcoma: systematic review and meta-analysis. Skeletal Radiol. 2016 Sep. 45 (9):1235-42. [Medline]. Enneking WF, Spanier SS, Goodman MA. A system for the surgical staging of musculoskeletal sarcoma. Clin Orthop Relat Res. 1980 Nov-Dec. 153:106-20. [Medline]. Enneking WF, Spanier SS, Goodman MA. Current concepts review. The surgical staging of musculoskeletal sarcoma. J Bone Joint Surg Am. 1980 Sep. 62(6):1027-30. [Medline]. [Full Text]. Boriani S, Weinstein JN, Biagini R. Primary bone tumors of the spine. Terminology and surgical staging. Spine. 1997 May 1. 22(9):1036-44. [Medline]. Hart RA, Boriani S, Biagini R, Currier B, Weinstein JN. A system for surgical staging and management of spine tumors. A clinical outcome study of giant cell tumors of the spine. Spine. 1997 Aug 1. 22(15):1773-82; discussion 1783. [Medline]. Winkelmann WW. Rotationplasty. Orthop Clin North Am. 1996 Jul. 27(3):503-23. [Medline]. [Guideline] NCCN Clinical Practice Guidelines in Oncology. Bone Cancer. Version 1.2019. National Comprehensive Cancer Network. Available at http://www.nccn.org/professionals/physician_gls/pdf/bone.pdf. August 3, 2018; Accessed: December 3, 2018. [Guideline] Casali PG, Bielack S, Abecassis N, Aro HT, Bauer S, Biagini R, et al. Bone sarcomas: ESMO-PaedCan-EURACAN Clinical Practice Guidelines for diagnosis, treatment and follow-up. Ann Oncol. 2018 Oct 1. 29 (Supplement_4):iv79-iv95. [Medline]. [Full Text]. Ottaviani G, Robert RS, Huh WW, Jaffe N. Functional, psychosocial and professional outcomes in long-term survivors of lower-extremity osteosarcomas: amputation versus limb salvage. Cancer Treat Res. 2010. 152:421-36. [Medline]. Janeway KA, Grier HE. Sequelae of osteosarcoma medical therapy: a review of rare acute toxicities and late effects. Lancet Oncol. 2010 Jul. 11 (7):670-8. [Medline]. Blattmann C, Oertel S, Schulz-Ertner D, Rieken S, Haufe S, Ewerbeck V, et al. Non-randomized therapy trial to determine the safety and efficacy of heavy ion radiotherapy in patients with non-resectable osteosarcoma. BMC Cancer. 2010 Mar 12. 10:96. [Medline]. [Full Text]. Vos HI, Coenen MJ, Guchelaar HJ, Te Loo DM. The role of pharmacogenetics in the treatment of osteosarcoma. Drug Discov Today. 2016 Nov. 21 (11):1775-1786. [Medline]. Yang JZ, Ma SR, Rong XL, Zhu MJ, Ji QY, Meng LJ, et al. Characterization of multidrug‑resistant osteosarcoma sublines and the molecular mechanisms of resistance. Mol Med Rep. 2016 Oct. 14 (4):3269-76. [Medline]. Xiao X, Wang W, Wang Z. The role of chemotherapy for metastatic, relapsed and refractory osteosarcoma. Paediatr Drugs. 2014 Dec. 16 (6):503-12. [Medline]. Marina NM, Smeland S, Bielack SS, Bernstein M, Jovic G, Krailo MD, et al. Comparison of MAPIE versus MAP in patients with a poor response to preoperative chemotherapy for newly diagnosed high-grade osteosarcoma (EURAMOS-1): an open-label, international, randomised controlled trial. Lancet Oncol. 2016 Oct. 17 (10):1396-1408. [Medline]. [Full Text]. Mankin HJ, Lange TA, Spanier SS. The hazards of biopsy in patients with malignant primary bone and soft-tissue tumors. J Bone Joint Surg Am. 1982 Oct. 64(8):1121-7. [Medline]. [Full Text]. Mankin HJ, Mankin CJ, Simon MA. The hazards of the biopsy, revisited. Members of the Musculoskeletal Tumor Society. J Bone Joint Surg Am. 1996 May. 78(5):656-63. [Medline]. Craig FS. Vertebral-body biopsy. J Bone Joint Surg Am. 1956 Jan. 38-A(1):93-102. [Medline]. [Full Text]. Clinical appearance of a teenager who presented with osteosarcoma of the proximal humerus (same patient as in the following images). Note the impressive swelling throughout the deltoid region, as well as the disuse atrophy of the pectoral musculature. Radiographic appearance (plain radiograph) of a proximal humeral osteosarcoma (same patient as previous image). Note the radiodense matrix of the intramedullary portion of the lesion, as well as the soft-tissue extension and aggressive periosteal reaction. Intense radionuclide uptake of the proximal humerus is noted on a bone scan (same patient as previous 2 images). A comparison bone scan of the involved shoulder (right image) with the uninvolved shoulder (left image) (same patient as previous 3 images). Magnetic resonance image appearance (T1-weighted image) of osteosarcoma of the proximal humerus (same patient as previous 4 images). Note the dramatic tumor extension into the adjacent soft-tissue regions. Core needle biopsy instruments commonly used for bony specimens. Craig needle set. Close-up view of Craig needle biopsy instruments. Cutting cannula with T-handle attached (top) and sheath through which the cutting cannula passes (bottom). Resected specimen of a proximal tibia osteosarcoma. The primary lesion was such that the knee joint was resected with the primary lesion. Note that the previous longitudinal biopsy tract was completely excised with the specimen. Intraoperative consultation with the pathologist, in which the surgeon and pathologist view the microscopic appearance of the biopsy specimen. Intraoperative consultation with the pathologist. A frozen section of the biopsy specimen is being performed. Intraoperative photograph of a Van Ness rotationplasty procedure. Osteosynthesis of the tibia to the residual femur is being performed. Courtesy of Alvin H. Crawford MD, FACS. Clinical photograph taken at the conclusion of a Van Ness rotationplasty procedure (same patient as previous image). Note that the new "knee" of the operative side (left side) is purposely reconstructed distal to the normal right knee. This is in anticipation of the future growth potential of the unoperated limb. Courtesy of Alvin H. Crawford MD, FACS.